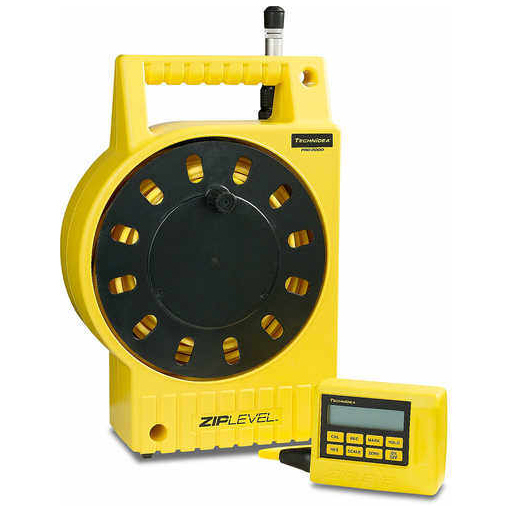 The ZIPLEVEL® PRO-2000 consists of a Base Unit that stores its hand held Measurement Module, 100' (60m) of interconnecting Cord, User Guide and all accessories. Accessories include, a rubber protective Boot for the Measurement Module, a Unipod for measuring without bending and a pair of stakes to secure the Base Unit on a hillside. The fully extended Unipod doubles as a 4' (121.9cm) vertical calibration standard for the system. The ZIPLEVEL® PRO-2000B is essentially a PRO-2000 with a shorter Cord and no accessories. The less expensive PRO-2000B comes without a protective rubber Boot, Unipod or Stakes and has 75' (23m) of Cord that covers a 150' (46m) circle. Each of the ZIPLEVEL accessories can be purchased individually. Purchase of Protective Boot is highly recommended for rugged applications. Rain tight; not immersible. Spray lightly to clean.